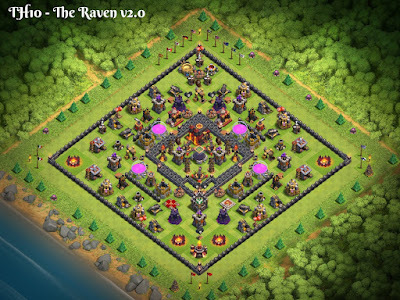 I present to you a TH10 base design; The Raven. The Raven TH10 base is a further modification of Aphrodi's original Crows base with Radiating's Birdland core. This version includes slight changes to pathing, a rebalancing of resource rings, addition of the new Bomb Towers, and modifications to the core. The Raven is an open base design that relies on pathing and distraction to decimate opposing armies before they reach the core. It's primary goal is to protect the dark elixir storage; gold and elixir are less important, so they become distractions and are dispersed to reduce potential losses. This is a debate that crops up on the official forums regularly. "Engineering is bad!"... "It's a valid strategy and part of the game!"... "It's ruining clan wars!... "It makes the game challenging!" We've already detailed the different types of engineering (see this article for more on engineering in general). But why is it good or bad for the game and why is everyone so up in arms about it? As I've said before, EVERYONE engineers to a degree, assuming they plan what they believe to be the most efficient path to develop their game. The individual player isn't so much the issue...it's when a bunch get together and craft a clan wars roster that draws in weaker opponents. Game Management: How to manage upgrades? As anyone who has read my articles knows, I'm a diehard rusher. I firmly believe that rushing strategically is hands down the best way to play this game. I might max the lower levels, but after TH7 I move quickly up the stack. I've discussed a bit of my strategy behind rushing in previous posts, but I've never really gone into detail on how I actually keep track of what I'm doing. Rusher or maxer, if you want to really track your game's progress, you need to get out of the game and into a spreadsheet or something similar. SuperCell has taken a step forward in providing suggested updates under the builder icon at the top of the game screen, but it only shows the next lowest 5 upgrades and that's not enough when there are upwards of 32 categories of upgrades (not including troops) comprised 122 structures and 300 walls. Strategy Series #5 - Maxing vs Rushing...which is better? Maxing and rushing both offer their own benefits and each suits different gameplay strategies. I use both, depending upon the end goal of my game and how I feel like playing at the time. Although I have a clear preference toward rushing, I would not call one or the other "better". First and foremost, let's just get this out of the way - no matter how much anyone argues against rushing, the simple fact of the matter is that it is the most efficient way to reach the endgame (max TH11). There's no way around it and there's no argument. Maxing has two significant drawbacks that puts it second to rushing - idle builders and lesser loot availability. It is hard to believe, but yes - it is now FIVE months in for the Clash Maniac game! I've been rushing this game with an eye toward both clan wars and getting ahead as quickly as possible. Keeping it clan-war capable changed up the strategic rushing plan quite a bit, especially since I have a tendency to war non-stop for 2 weeks at a time. Strategic rushing while warring is very different from doing the same without participating in clan wars. The reality is that you can rush MUCH more quickly if you do not war. The reason is simple - in non-war rushing, you can focus simply on your key farming troops and a basic, low level of defense; if you war, you also have to ensure you have 2 or 3 attacks that are suitable for clan wars and can defend against one TH level lower than your own. The latter part of that point is particularly important - you do not want your game to be easily taken out by an opponent who is attacking UP. Debate: Is the casual game really dead? In December of 2015, SuperCell (SC) made a change to the game that could only be described as a serious game changer. Ok - bad pun, but it really did rock the Clash of Clans (CoC) world. Previous to December, the townhall (TH) really didn't have any value in the regular game. In fact, it's greatest value was as a sacrificial lamb; by placing it OUTSIDE the walls, you invited a TH snipe. This would cost you a few trophies, but it would also provide a 12 hour shield that kept your resources protected and TH snipers seldom went for anything more. Of course, this is antithetical to the very concept of a tower defense game; how is it tower defense when you sacrifice the tower itself?! The gang at SuperCell have put together a smash-banger of an update for us this fall with new troop levels, new defense levels, an all new defense, arranged wars, lower costs, a new army training dialog, and more. This may actually be even more than we saw in the year end updates in 2015 (well, minus TH11 of course!). There's a lot to talk about in this update. The full announcement is HERE if you'd like to go piece by piece through it. Strategy Series #4 - Farming army composition. Effective game play on Clash of Clans requires gold, elixir, and (later) dark elixir (DE). You can either buy it with gems or raid it in the multiplayer game. Buying resources with gems gets real expensive, real quick. A better solution: raid it. Raiding in CoC yields better results today than at any previous time in the game. There are many, many games available in the multiplayer track with hundreds of thousands in elixir and gold; finding games with 2000, 3000, and more units of DE is easy. You don't even have to hit the NEXT button very often. 1) Dead Base Raids - When you come across a dead base that hasn't been raided in a while, you've the jackpot. Sometimes these are players who quit, while others are the kid who was grounded for a week. Whatever the cause, the base is loaded and prime for raiding. It's been a couple of weeks - and busy ones at that! Along the way, I've finished off another TH7, upgraded our TH5s to TH6, and run some key upgrades on my TH9, TH10, and TH11 games as well as the TH8 Clash Maniac, TH8 defenseless, and TH8 mini-max. I thought I'd recap a bit here.